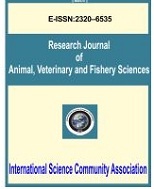 International Science Community Association are publishing an international peer reviewed journal Research Journal of Animal, Veterinary and Fishery Sciences. It is the vision of International Science Community Association to publish research papers, research articles, review papers, mini review, case study and short commutations in all areas of human study without financial restriction. Coverage Area: Researches in the field of animal, veterinary and fishery sciences which including animal pathology, animal and environmental hygiene, animal behaviour and welfare, animal protection, animal genetics and breeding, animal reproduction and nutrition, animal husbandry, animal health, viral diseases, disease and prevention in both domestic and wild animals, veterinary medicine, veterinary pharmacology and toxicology, veterinary skills and professional practice, natural ecosystems, security and safety, biochemistry of tissues and organ systems, anatomy, cell biology, diagnostic pathology, drug discoveries and therapeutics, growth, immunology, microbiology, bacterial diseases, metabolic disorders, physiology, pharmacology, parasitology, poultry science, fishery science and technology, dairy science and management systems, Hydrology, water treatment and management systems, etc. Contribute your manuscript for Journal.